Learn why Jeffrey Gitomer’s 12.5 principles of sales greatness are still very much relevant in the social selling era. In part 1 of this 2-part series, we closely examined the reasons best-selling author Jeffrey Gitomer provides for why people buy. In part 2, we will take a closer look at Gitomer's 12.5 principles of sales greatness. 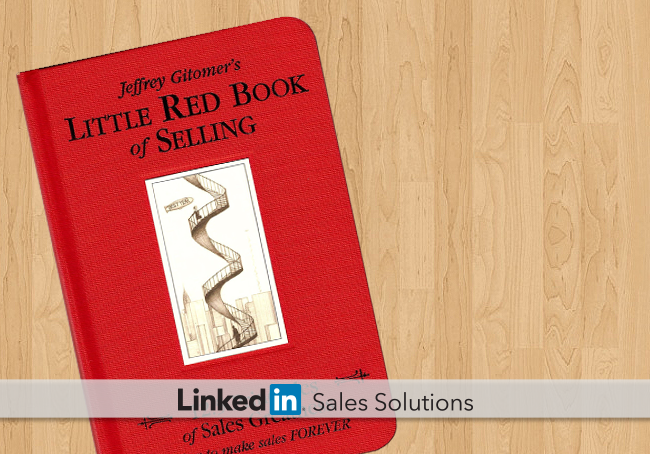 It's amazing how, despite the fact that the Little Red Book of Selling was published in 2004, these same principles are easier to apply today in the social selling era than they were nearly a decade ago. Here are a few symptoms that you may not be self-motivated, or “sales responsible,” as Gitomer calls it. Long strings of rejection and “can’t miss” prospects going dark can take a toll on you… if you let it. No one is going to put a boot to your backside for you. It’s on you to quit whining, pull yourself up and continue attacking the day with vigor. To be great at sales, be your own sales manager who demands more of yourself. There is an unending list of things you can do to become better at sales. What’s the worst that could happen if you pushed yourself a little harder? Gitomer maintains “the workday starts the night before.” Being prepared means knowing everything you can possibly know about your prospect’s company before a meeting so you can ask about what you don’t understand. In the digital era, asking questions from a position of ignorance is completely unacceptable. You know it. Your prospects know it. LinkedIn is a terrific place to start for research, both on your prospect and your prospect’s company. For most sales pros, personal branding is accomplished through an optimized LinkedIn presence. Don’t be a no-show when a prospect goes looking for you online. Make sure you are not only visibile, but have put your best digital footprint forward. The right contacts and connections can boost your social selling success to another level. Luckily, professional networking has never been easier than it is right now, in the era of LinkedIn and social selling. Many sales situations exist where LinkedIn contacts can help you build relationships with your prospects. And a networking solution like TeamLink is almost unfair as it increases your network exponentially by displaying how prospects are connected with your entire company. Sometimes it’s easy to convince ourselves that we’re making headway into an account because we’ve got a chummy relationship with someone on the inside. But when that relationship doesn’t yield access to the true decision maker, it’s all for naught. Do you routinely hear, “I like it, let me run it by my boss.” If so, you’re doing it wrong. If you don’t step out of your comfort zone and attempt to gain access to the decision maker, you’re just wasting away in comfortableville. Your sales strategy should include the tangible outcomes and measureable results that get meetings with decision makers at the outset. Gitomer proclaims the most important aspect of making a sale is also a major weakness of every salesperson. If you said asking questions, you are correct. Extensive research is one way to ask smarter questions. And if your prospects are silent, it’s actually a good thing. It means you asked a smart, thought-provoking question. Now just pipe down and let them answer. This principle isn’t for everyone, and it can sometimes backfire. But if you have a knack for getting others to chuckle, you definitely have an unfair ice-breaking advantage over your competition. Sometimes it’s as simple as sharing a funny story. You are not limited to your company’s sales methodology and marketing assets. Give that brain of yours a workout from time to time. Think of new ways to make yourself unlike any other sales rep your prospect will encounter. Today’s buyers want proof. How are you giving it to them? Be honest, how many times have you missed a golden opportunity for a testimonial? If you’re like most sales pros, the answer is a lot. The best time to ask for a testimonial is the exact moment you get a pat on the back. A LinkedIn testimonial will serve as proof for all the future prospects scoping you out before deciding whether to proceed. Gitomer encourages sales pros to user their sixth sense: the sense of selling. You have the power to set your mind right for sales greatness. To learn Gitomer’s six positive sales senses, buy his book. You’ll be glad you did. We can’t give away everything here (we haven’t even scratched the surface). Reading content from successful LinkedIn sales influencers on a daily basis via the Pulse app is a fantastic way to keep your confidence and determination sky high! You have your own career to worry about. Stay focused on it. There’s no use getting caught up in other people’s drama. Jeffrey Gitomer doesn’t mince words when he describes what it takes to achieve sales greatness, but it’s a good reminder that to achieve success, sometimes you need to be blunt with yourself. How are you demanding more of yourself?